If you use social media, you know how frustrating it can be to invest time and energy into creating posts, only to have them receive minimal engagement. This is especially frequent on Facebook, where brands saw a 50% decrease in organic post impressions last year. You may think that this means you’re wasting your time on the platform, but don’t give up hope just yet. Considering that Facebook currently has 890 million daily active users, it can certainly be an effective way to reach a wide audience. So how can you better reach this audience when post reach is on the decline? That’s where sponsored posts come into play. Facebook has several advertising options, and choosing the right ones can help you utilize the platform’s full potential for your company. Read more to find out how you can benefit from advertising on Facebook. If you don’t have a Facebook Page for your business, you’ll need to create one. Even if you don’t decide to use paid advertising options, creating an account is a free way to get started with social media and can help you get a sense for how it could potentially help you reach more customers. You’ll first have to log into your personal account, then go to the create a Page option on Facebook and follow the instructions. The setup process only takes a few minutes, and you can always go back later and add additional information and photos. So how can you start increasing your company’s Page likes, post engagement, and conversion rate? Keep reading for a comprehensive look at Facebook advertising options and a step-by-step explanation of how to create a Facebook campaign. 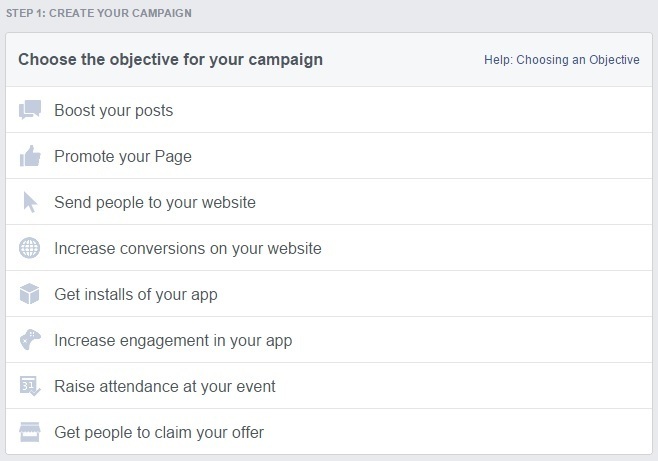 When you go to Facebook’s Ads Manager page to start your campaign, the first thing you’ll be asked to do is choose an objective. The one you choose will depend on your social media goals, but they all have slightly different functions in your advertising strategy. If you already have an established Page, boosting your posts will help them reach more of the people who already like your Page. You may think that the photos and statuses you share are automatically shown to all of your fans, but that is not the case. Facebook limits the amount of people who see your posts, and boosting them is the only way to increase that. If you’re just starting out with Facebook or don’t have a lot of fans, promoting your Page is a good first goal. You can create posts to show to users who do not already like your Page, and Facebook will put a “Like” button on it so they don’t even have to leave their news feeds. If you’re only using Facebook to get more site traffic, this is the right goal for you. Facebook discourages links to outside sites, and will show them organically to even fewer people than a regular post, so paid advertising is the most reliable way to reach your followers with linked posts. If you run an ecommerce site, simply getting traffic to your site probably isn’t enough to make Facebook advertising worth your while. Instead, you’ll want to create posts that not only link to your site, but also encourage users to take specific actions once they get there. By tailoring your ad to specific goals, like newsletter signups or product purchases, you can increase the likelihood that visitors will take those actions. If your business invested time and energy into creating an app, you certainly want people to download and use it. Promoting it on Facebook can be an effective way to do so, as you can target ads for it specifically to users you think would be interested. 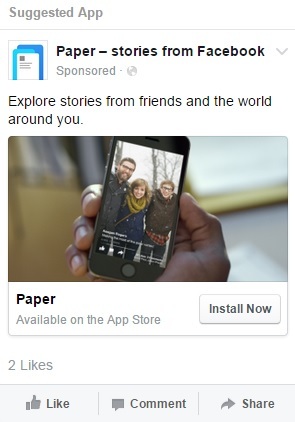 These ads only show to users on mobile, and allow users to download your app without ever leaving Facebook. If you are hosting a seminar, festival, or other event, Facebook can be a great way to improve attendance. Creating event pages is a simple way to invite users and get RSVPs, and promoting them will help increase awareness and interest. If you’re currently running a special or offering a coupon code, promoting them will encourage more people to take advantage of the offer. Paying to give more discounts may seem counterintuitive, but driving purchases is never a bad thing. When users click “Get Offer,” they will be sent an email with details about how to redeem it. You can set limits on how many people can claim the offer, and can include additional information like terms and conditions in the email. Even if users don’t end up using the discounts, you’ll still generate website traffic and awareness of your products. What method should I try? The objective you choose is entirely depending on your company’s social media goals. If you are just starting out, promoting your Page is a good choice. This will help boost awareness of your business and generate likes for your Page, which will give you a solid foundation for future campaigns. If you can’t choose just one, running multiple campaigns at a time is also an option. It’s probably best to start with just one to get a feel for advertising on the platform, but once you’re comfortable with process, running multiple campaigns can help speed up your results. You can also select who you want to reach with your advertisements. You can choose basic options like location, age, gender, and language, as well as more advanced criteria like interests, behaviors, and connections. This allows you to target specific users – as specific as, let’s say, users who recently purchased a smartphone or tablet and are interested in physical fitness and nutrition. By targeting your ads to the people you want as customers, you avoid wasting money on advertising to people who are unlikely to be interested in your company. After defining your audience, you’ll need to set a budget for your campaign. This budget can be a daily amount or a “lifetime” amount, meaning that you determine up front how much you want to spend on the entire ad set. 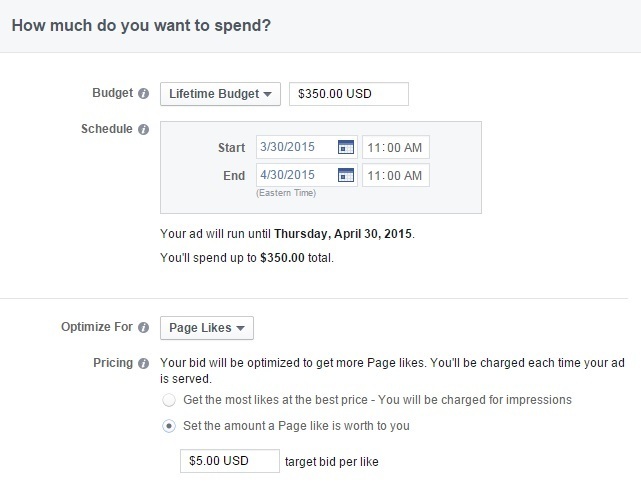 Depending on your campaign objective, you can also choose optimize your pricing for likes or clicks. 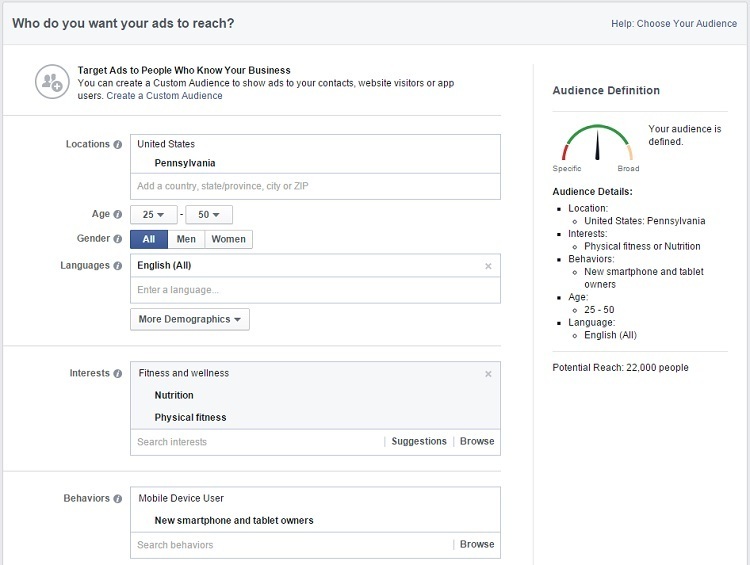 You can then choose whether to be charged for the amount of people who see your ads (impressions), or for the amount of people who actually click the ad or like your Page. Facebook’s pricing options can be confusing at first, but setting a budget up front lets you determine exactly how much you want to spend on advertising. After a few campaigns, you’ll get a sense of how effective your budget is. 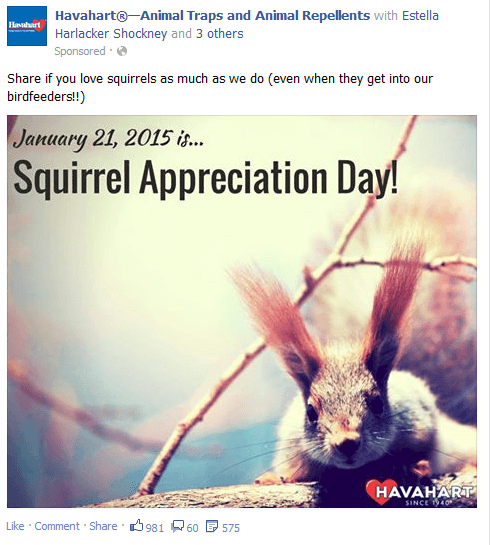 In this example, Havahart Wireless made a photo post and encouraged fans to share it. The post received a decent amount of impressions and engagement organically, but boosting it helped it reach even more users. With a budget of only $50, this post was able to reach 47% more users than it would have without advertising. From there, you create your ads using text, photos, and possibly links. You can opt to create a single ad or a few different options, then preview what they will look like in users’ news feeds. 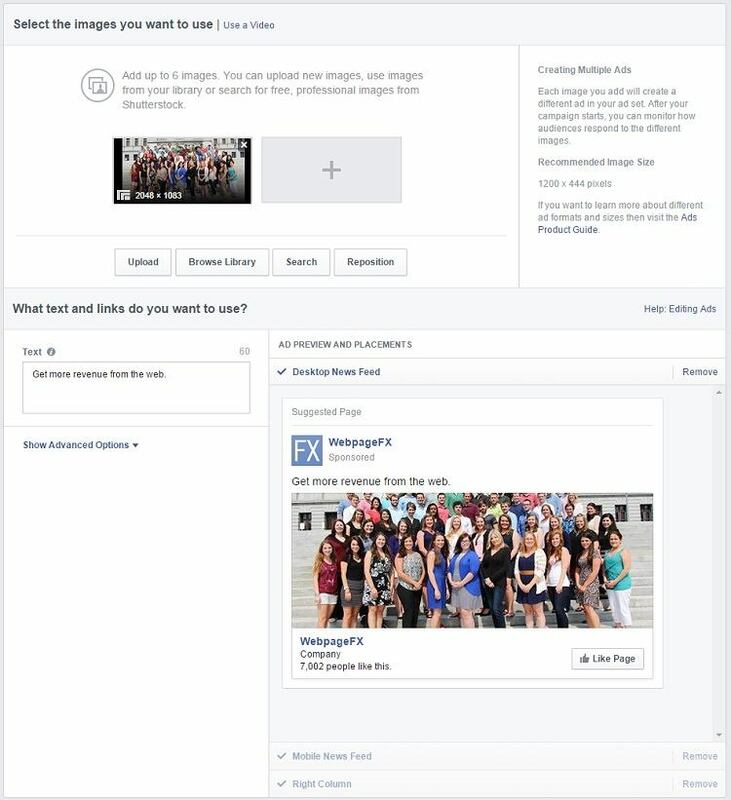 Facebook also allows you to choose whether you want your ads displayed to desktop users, mobile users, or both. For most businesses, it is probably best to advertise in both mobile and desktop news feeds. You can also opt to have your ads display in the right column of desktop users’ news feeds. That being said, if you know that your demographic has a preference for one or the other, it might be wise to use the platform they are more accustomed to. If you aren’t sure, you can opt to run both for short-term campaigns, then take a look at their results. If one placement is more effective at accomplishing your goal than the other, you can use that knowledge for your next campaign. Is Facebook advertising right for you? Still not sure whether or not paid Facebook advertising is a good option for your brand or business? The best way to find out is just to experiment. Create a Page and see how your updates perform organically, then consider testing out some paid options. Although social media marketing won’t work for every business, you never know how much one additional channel could affect your company. For more information on the specifics of advertising on the platform, Facebook has its own ads guide, which provides a pretty comprehensive look at their advertising options. The guide also includes image size, text length, and link description recommendations, which help ensure that your ads will display well on both desktop and mobile. 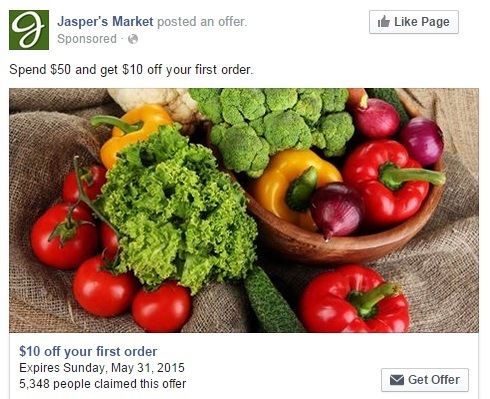 This post on Facebook advertising is the first in a series about paid advertising options on social media. Stay tuned to learn how to promote your posts on Twitter, Pinterest, and LinkedIn!